Challenge to Tier 3 | Industrial Power Alliance, LTD. The prime pollutants of diesel engines are particulate matter（PM) and NOx. 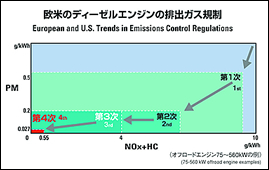 Each government in Japan, the United States, and Europe has implemented emissions standards for construction machinery and other equipment. Tier 3 requires a 40% reduction of NOx from Tier 2 level. 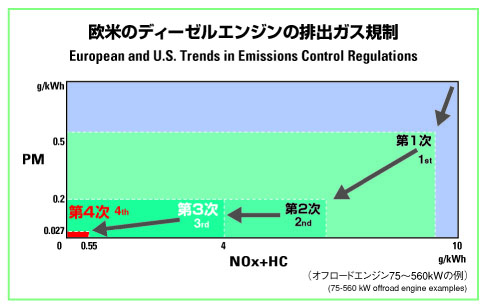 Lowering combustion temperatures reduces NOx emissions but increases PM emission. So, we set out to develop a diesel engine that slashes both PM and NOx emissions while improving fuel consumption and power. This effort led us to develop ecot3 technology. Over the next few years, Tier 4 emissions standards will be enforced, which require PM and NOx emissions to be almost zero. Our engine development work reflects those requirements. But we aim to do more than just clear the standards. Our mission is also to deliver better value. This leading-edge system reduces NOx emissions without lowering fuel economy, reusing some of the exhaust gases through a proprietary twin-valve setup to enhance performance. This system reduces PM, NOx, and other emissions while increasing power. It employs a common rail and a computer to optimize fuel injection volumes and timing. 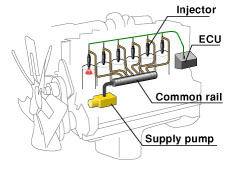 The system delivers almost complete combustion because it enables multi-stage fuel injection. We used proprietary technology to specially shape the combustion chamber to reduce PM and NOx emissions, fuel consumption, and noise. 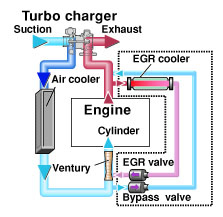 This system uses a huge volume of air to cool hot air from turbocharger compression. It combines a cooler and a hydraulic drive fan to send inducted low-temperature air to the cylinders at high precision, thus suppressing NOx emissions. Electronic controls swiftly process signals from sensors installed around a vehicle to provide complete control. 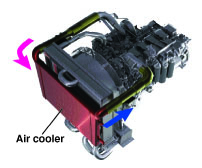 This system lowers environmental loads while optimizing engine performance under all conditions.